From April 2005 all parent employers of nanny’s regardless of income were able to take advantage of the Employer Supported Childcare Voucher Scheme however from April 2011 the vouchers became means tested meaning all parents could still claim the vouchers but people on higher incomes could claim less. The scheme still offers attractive tax relief to parents giving a substantial saving on childcare costs but sadly was closed to new applicants in 2018. Childcare vouchers are simply another way of paying your nanny. As an employer of a nanny you and/or your partner are able to earn up to £243 per month deduction free as long as that money is used for childcare. There are a set of criteria that your nanny must meet before you will be able to claim the vouchers. These criteria are set and assessed by Ofsted and your nanny will need to be registered with Ofsted before you can claim the vouchers. Your nanny has the skills required to be a nanny or even better a childcare qualification. Your nanny has an up to date and valid paediatric first-aid certificate. Your nanny has an up to date public liability insurance policy. Your nanny can pass an Enhanced DBS check which will need to be carried out as part of her registration process regardless of if she already has one. Once set up, the process is fairly simple to run. Your employer deducts at source part of your income which is then turned into vouchers. The term vouchers can be misleading and in fact no actual voucher is normally issued it is just the term given to the money that is passed to your nanny, usually via bank transfer, from the voucher company. These vouchers are usually sent directly to your nanny and become part of her net pay for that month. To start the process of claiming the vouchers NannyPaye suggests your first step should be towards your own HR department of your own employer. This is because the vouchers have to be employer supported i.e your employer has to offer them as part of their package of benefits to you. If they do not offer the vouchers then you will not be able to claim them. Once you have ascertained you can claim the vouchers and assuming you feel you nanny will meet the Ofsted criteria you should ask your nanny to contact the Ofsted website where she will be able to go through the registration process. Alternatively you or your nanny may wish to call the Ofsted helpline on 08456 404040 for further information. 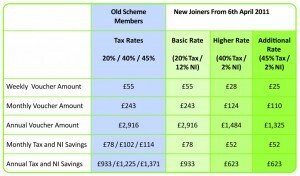 From April 2011 the savings have become means tested so people on different tax bandings save different amounts. The minimum saving per parent is £623.00 pa so even at the lowest level is still a good saving when you consider both parents can claim the vouchers. The chart below shows you the savings you can make. The exact way that childcare vouchers work will vary between employers. Contact your employer for details of your company’s scheme. Childcare vouchers are a salary sacrifice scheme so they are deducted from your pay before the calculation of taxes. This can affect entitlement to benefits provided by your company connected with salary, such as pension and bonus schemes. You register with your company childcare voucher scheme. You decide on the amount of voucher to be paid each week/month (maximum of £243 a month) and a payment date. It takes time to process payments so having a date around the 20th of the month can help ensure your nanny is paid by their pay date. Your nanny registers with your company childcare voucher scheme as a provider. They will need to provide their Ofsted registration from their certificate and they may be asked to provide a copy of their certificate. They will also complete bank payment details so that they can be paid. You confirm that your nanny is your childcare provider. Entitlement checks are carried out by the childcare voucher scheme provider. You may need to authorise voucher payments each week/month, or the system may automatically send payments as long as your earnings have met a qualifying amount. The childcare voucher forms part of your nanny’s NET pay, so you would look at the payslip for that week/month and deduct the voucher amount from the NET pay prior to paying your nanny the remaining salary via Internet Banking / Faster Payments / Cheque or Cash. The childcare voucher company emails your nanny to confirm that payment is being made. The childcare voucher company pays your nanny directly the voucher amount via BACS, which typically takes 3 working days. Some employers may manage this scheme themselves or they will contract out to a childcare voucher company. How your company’s childcare voucher scheme works will vary so this guide is to give you a general idea but you must obtain full details from your employer.